WE WOULD like to thank Rosemullion Veterinary Practice for another fantastic Bark in the Park event this year, and for kindly donating a cheque for £200 to K9 Crusaders. 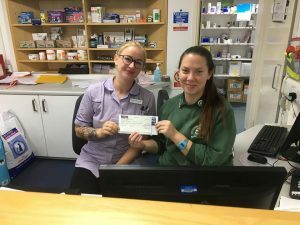 Thank you to Jodie Morris for receiving the cheque on our behalf from the nurses at Rosemullion Veterinary Hospital in Falmouth. Looking forward to next year’s Bark!